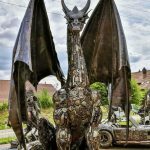 One of my Facebook friends posted an image of this marvelous sculpture of a dragon built from automobile parts. 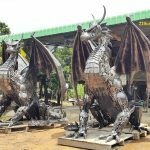 I searched the web for more information and found more images from different angles. Unfortunately I didn’t find any credit for the sculptor, but if anyone knows, please let me know.